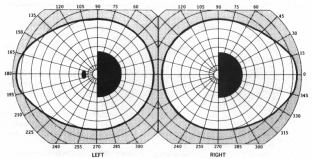 The Visul Fields are a measure of the area from which you are able to perceive visual signals, when your eyes are in a stationary position and looking straight ahead. read, recognise faces, detect colours. enables safe navigation around our environment. 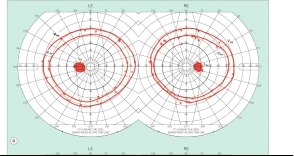 Help diagnose a vision/brain condition. 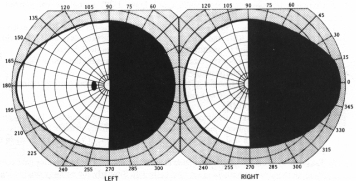 Relative field defect/scotoma - a light target can be seen but only when it is made brighter or larger (that is, reduced sensitivity). 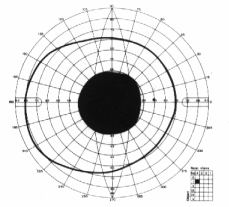 Absolute defect/scotoma - No response to a stimulus regardless of brightness or size (definitive absence of processing from this area). 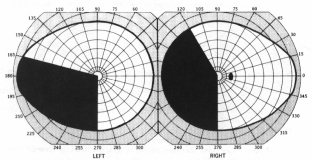 Two ways to measure the visual field. Size of field dependent on a lot of variables. 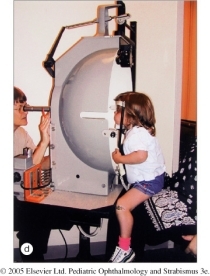 From 2 months to 8 months there is rapid development of the visual field. Slows down but continues until 12 months. 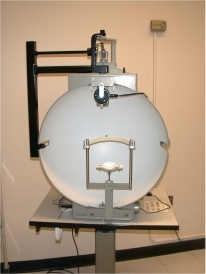 Light stimulus is moved from outside of bowl towards the centre. 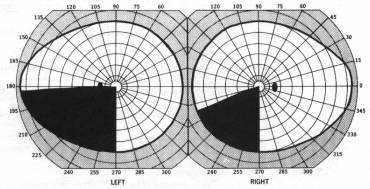 Light source can be varied in size and brightness. 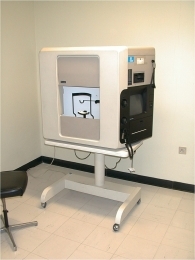 This is a quick and easy test which we will be demonstrating in the afternoon session. 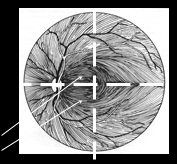 Looking at the pattern of field loss – we can get an idea of where a problem may be occurring within the eyes and/or the brain. 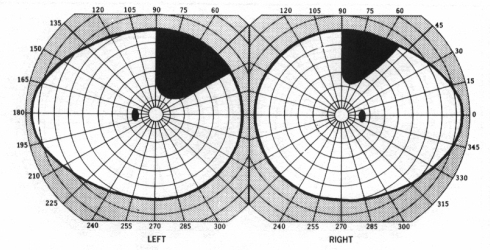 Inferior defect – quadrantopia damage to the superior fibres passing through parietal lobe – affecting peripheral and central area of field. 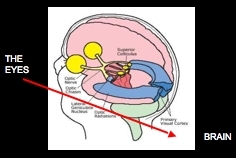 The visual cortex is within the occipital cortex – the brain area corresponding to the fovea takes up a larger percentage than the peripheral field. 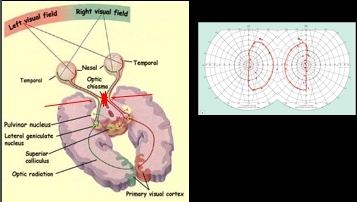 If the visual cortex is damaged on one side the field will be absent to the opposite side in both eyes – homonymous hemianopia. 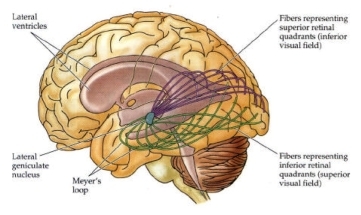 Left side of brain – occipital lobe. 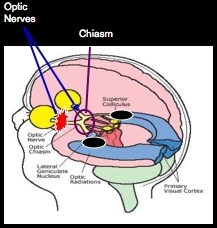 Lesion affecting both visual lobes will be devastating to vision – result in cortical blindness. 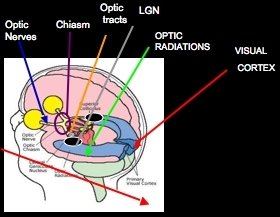 Lesions within the visual pathway can lead to a series of different field defects – some which will have more catastrophic effects than others. 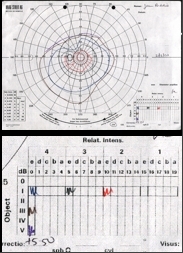 Effect on functioning can be predicted by measuring fields. 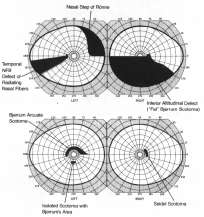 In some children (that is, children with PVL or hypoxia at birth) this can account for only one half of the story. 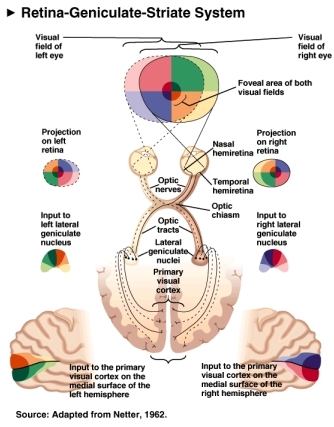 Higher visual areas use the information that reaches the visual cortex which is delivered through the visual pathway. Objects in our environment fight for attention and we cant process everything to a high degree. Instead we are selective in what we look at – not all under conscious control. 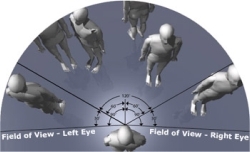 Top-down – visual attention – parietal lobe – maintaining interest when information is competing from each visual field. 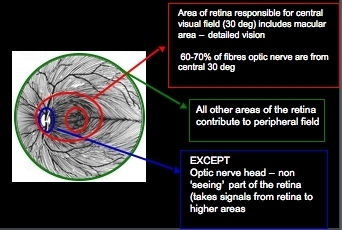 The prognosis for rehab of field defects which exist in addition to attentional difficulties is much poorer and their visual experience different to children with isolated field defects.